Today, an old man went on television and complained about video games. Then someone proved him horribly wrong. 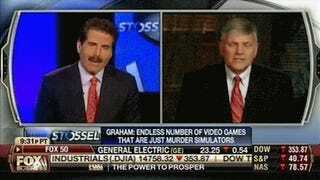 Franklin Graham, son of Billy Graham and current head of the Billy Graham Evangelistic Association, went on the John Stossel Show on Fox Buisness to tell why he thinks violent games are abhorrent and deserve to be taxed. Stossel, confused, struggled to understand the logic behind Graham's argument. God gets violent games because of that whole crucifixion business. We tax cigarettes, therefore we should also tax videogames because they’re the same. I miss my old cowboy TV shows. Gunsmoke was awesome, I’ll tell ya what. We're addicted to violent media "like the Romans". I’m old and this brave new world frightens and confuses me. Crime in America is down on the whole. Japan has higher game usage, immensely lower violence. There is absolutely no evidence to suggest that games make you violent. This is the exact same hysteria as comics in the 1950s, dressed up for a new generation. Look, I don't agree with Stossel about 99 percent of the time, but that's completely irrelevant right now. The man has done his homework on this one, and a shocking display of basic competency like this is something you simply don't see a lot of on television. So Stossel? Today you've earned your facial hair.